Kersplatt! 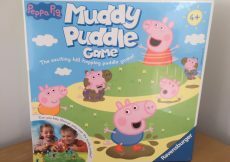 is a new family game from Paul Lamond games, for two to four players aged 6+. 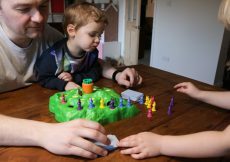 We had no idea what to expect when we received the game but we’ve had a brilliant time playing! 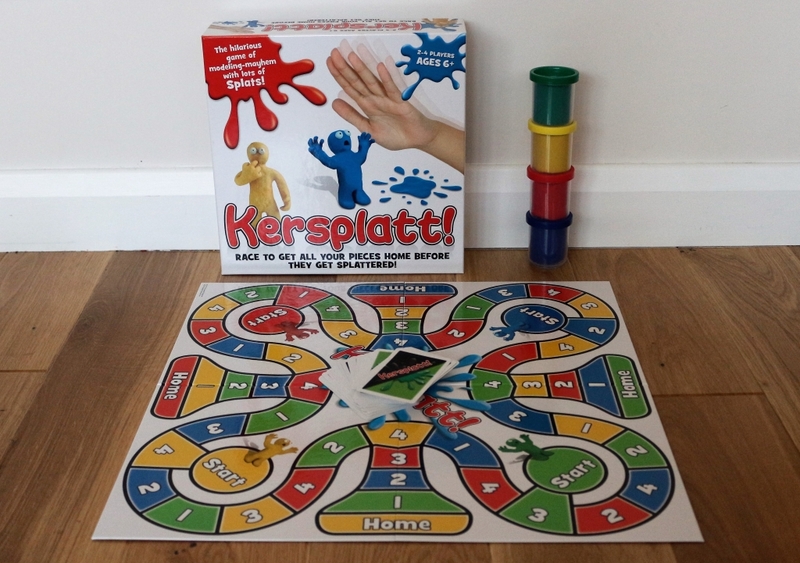 So what is Kersplatt! and how do you play? 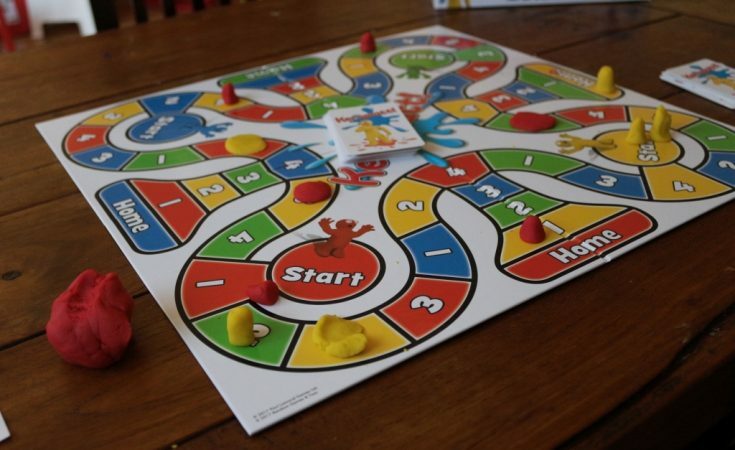 The aim of the game is to race two of your four Play Doh pawns around the board and home before anyone else, and before they are Kersplatted by your opponent(s)! 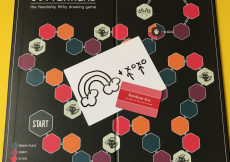 The youngest starts and you take turns to move your pawns, which you create out of dough, by selecting cards which give you a choice of spaces to move to. There are three different types of card; number cards, colour cards or Kersplatt! cards. If you get a number/colour card, you can move any one of your pawns to its nearest space of either the number or colour, usually whichever is furthest away, to get around the board quickly! If you get a Kersplatt! card you can either move to the nearest colour square indicated or Kersplatt! the opponent who is nearest to your home space. If your pawn is Kersplatted then not to worry; just make a new pawn and go back to the start. Once pawns are Kersplatted they can’t move, leaving a dead space on the board, and so the game becomes faster with fewer spaces to land on. 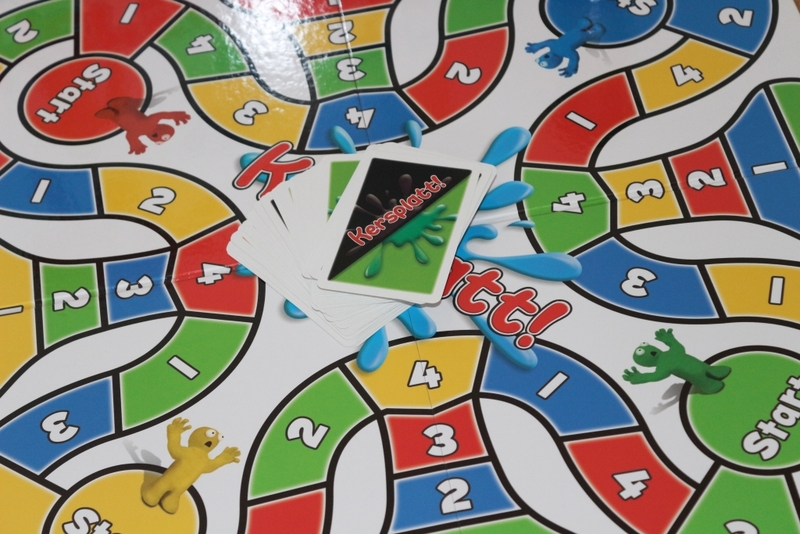 Although my children are a bit young for this game we split into teams for the first round. They loved splatting the pawns and by the second round my four year old demanded to be play on her own; the colour and number matching is also a good educational tool for her age group. Here is a video of how to play Kersplatt! and our game. I won’t spoil the ending (but I won!). Kersplatt! is a great game, we had a lot of fun playing it and it lasts just the right length of time. The RRP is £14.95. It is available online from the Paul Lamond website. Follow them on Twitter or Facebook for updates. We were sent this Kersplatt! game by Paul Lamond games for free for the purposes of our video but all words and pictures are mine.